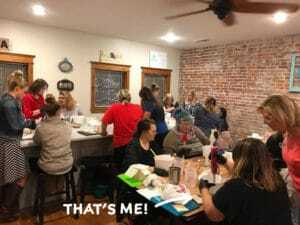 Last night I took a soapmaking and bath bomb class. The instructor was Janet Stevens with Natural Farm Soap Company. It was a fantastic class and I had a great experience. The night started out a little surreal because I hadn’t realized that my town’s tree lighting ceremony was happening on the same block at about the same time that the class started. It looked like something out of a Hallmark movie. Every family in the community appeared to be milling around anxiously awaiting the beginning of the holidays and the lighting of the Christmas tree at the town center. I felt like I was in an episode of Gilmore Girls. All the shops on the main street were open, people were joking and laughing, and there were decorations in every shop window and on every light post. Needless to say, there was no place to park. After parking three blocks away, I was a little late to class. Janet did a fantastic job of instructing us, and the ladies at my table welcomed me and made me feel instantly comfortable. I had signed up by myself so it wasn’t like I had someone that I knew taking the class with me. It looked to me like there was about 20 people or so in the class. First up was soapmaking. Janet talked about the dangers of using lye and we put on our plastic gloves and safety glasses. (Safety first!) We added water to the lye powder first and mixed it until the lye was dissolved. The mix instantly got hot. Janet said it gets to about 200 degrees because of a chemical reaction between the lye and the water. We then set that aside and began mixing several different types of oils. The key to soap making isn’t measuring the ingredients by cups or tablespoons. All the ingredients are measured by using an electronic kitchen scale. This particular recipe called for Palm Oil, Olive Oil, and Coconut Oil. We weighed and added those together and then added the liquid lye mixture. We mixed all this together with a handheld mixer until it was creamy (it looked like vanilla pudding). We then added a mixture of castor oil and mica powder (a colorant) to our bowl and mixed that with our soap mix until it was completely mixed in. I picked purple colorant, which didn’t end up really dark purple, just kind of a light, light purple. We also added the scent. I chose one called Autumn Leaves (or Autumn Spice, I can’t remember which). Lastly, we poured our mixture into a wooden soap mold that was lined with paper. Janet told us that our soap should be ready to pop out of the mold and cut up about 24 hours after the class. I’ve done that now and wanted to include a picture of my soap after being cut into bars. You’ll see it in the below picture. 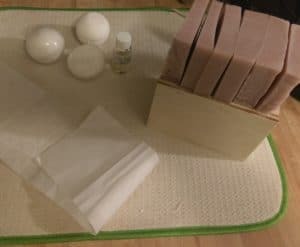 The soap is sitting on top of the wooden soap mold in the picture and the papers next to it are the papers that I used to line the soap mold so that it was easy to pop the soap out. You’ll also see my bath bombs in the picture and a small bottle of scent that I had left over after the project. After all that though, the soap isn’t ready to be used. I have to wait about 4 weeks for the soap to harden and dehydrate. Janet mentioned that we need to prop the soap up (don’t lay it flat) and that we also need to rotate it during the 4 weeks. Interestingly, she said that if we were to weigh the soap during this time, it would change in weight from day to day as it hardens. It is officially ready once the weight of the soap stays consistent. Based on when I took the class, my soap should be ready just in time for Christmas. Then we did bath bombs. 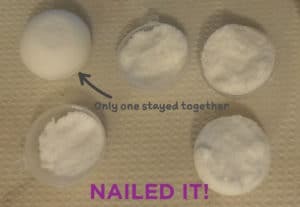 We used a baking soda mixture and added alcohol. We mixed that together by hand and then added the citric acid and the scent. We sprinkled the mixture into the bath bomb molds and I left for home with instructions to let the bath bombs air out once I get home. The results . . . I nailed it! Two of the three fell apart. This isn’t Janet’s fault though, she instructed us and mentioned the role that the alcohol plays to bind everything. She even mentioned spritzing the bombs with the alcohol mixture if they weren’t holding together. I just didn’t have any of that once I got home. But one of them turned out beautifully! I will definitely try it again though. I just need to have the right supplies at home. So that is my experience in a nut shell. The course was held at Pinspire, LLC, in downtown Lee’s Summit, Missouri. I highly recommend Pinspire and Natural Farm Soap. Everyone that I met was really helpful and friendly. I loved the experience and can’t wait to try to make soap and bath bombs on my own! Update: I’ve now been making soap and bath bombs at home and I’ve gotten several things that I highly recommend if you want to try this yourself. All are available on Amazon.